Tucked into the trees for peace and privacy, TARA is just a one block stroll from the life-guarded Chicahauk beach, a bargain, for sure. Families continue their tradition of vacationing at comfortable TARA, with its ocean view and amenities designed for rest and relaxation. Screened bunk room, picnic table, hammock, swing. Great room with flat screen TV, fireplace, dining table that seats 6 - 10, breakfast counter that seats 4, well-equipped kitchen, dishwasher and microwave, wet bar, laundry closet. 3 bedrooms (1 with Queen, 1 with Twins, 1 with Pyramid bunk, rollaway), 2 baths (1 with tub and shower; 1 with shower). Screened porch with dining table, lights and swing. Wrap around sundecks with furniture and picnic table. Tara has access to nearby Chicahauk community amenities which include tennis courts, a playground, and basketball court. In addition to being just a short walk to the lifeguarded Chicahauk beach access with light controlled crosswalk, this vacation home also offers easy access to the Southern Shores multi-use path that can be used for biking, walking, or jogging. It is just about a mile from a yoga studio and some great Southern Shores and Kitty Hawk restaurants, including: Coastal Provisions Market, Duck Donuts, and High Cotton BBQ, to name just a few. 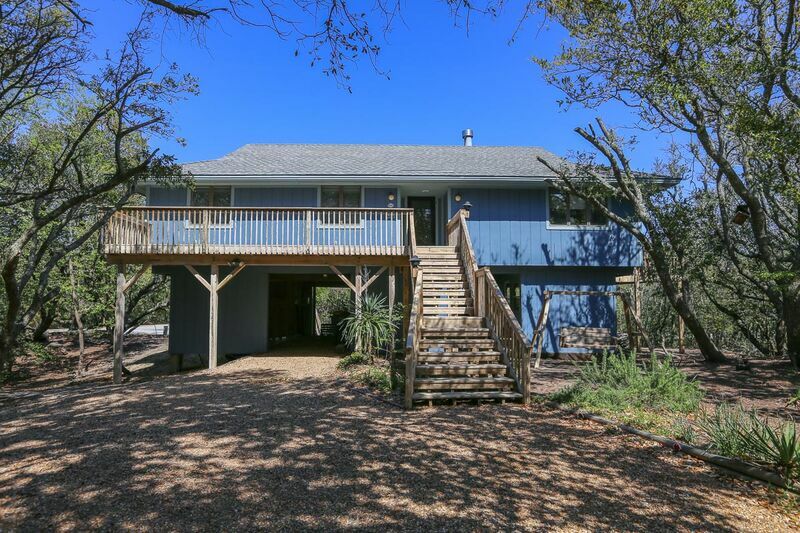 This traditional Outer Banks cottage is perfect for those looking to be close to the beach in a relaxing neighborhood setting.